Print, copy or scan to file. We can print on up to 13 x 19 paper stock or up to 110lb cover stock. 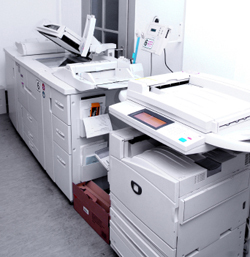 Our Xerox color copiers produce Superior print quality.Our color copier/printer will print at up to 2400 x 2400 dpi, the highest resolution in its class. We use a Fiery Controller to send all our files direct to the printer, so every copy is as good as the original. Xerox is a leader in the industry and they prove that by producing a machine that makes consistent high quality reproductions.